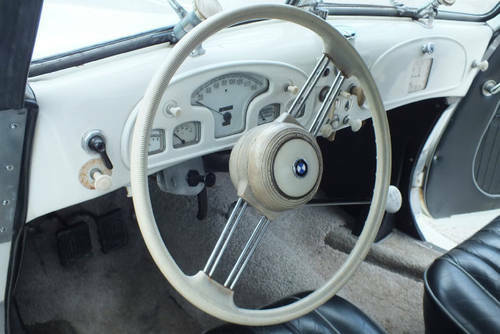 The thing that surprises many people (including myself) when they first pilot a 1930s 320 series BMW is just how modern they feel when compared most other cars of the period. Given that the specification includes a very advanced engine design, independent front suspension, rack and pinion steering and very good hydraulic brakes then we should perhaps not be too taken aback by how well they drive. Whatever the reason there can be no doubt that their performance and handling is definitely a cut above many of their contemporaries and it feels much more like a good sporting car from a couple of decades later. 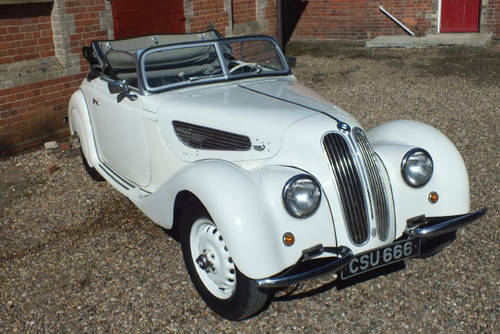 I had never driven a BMW 327 before so I decided that instead of having it trailered the roughly 120 miles from where it was being stored I would wait for a nice day and drive it home on good old fashioned A roads. This turned out to be one of my better decisions as I think I can safely say that it was one of the most enjoyable drives I have ever had in any car and I have been fortunate enough to find myself driving some quite serious machinery in the past! Perhaps I was being a bit spoiled as this particular drop head coupe is one of a minority of 327s which left the factory fitted with the much more powerful 328 engine. 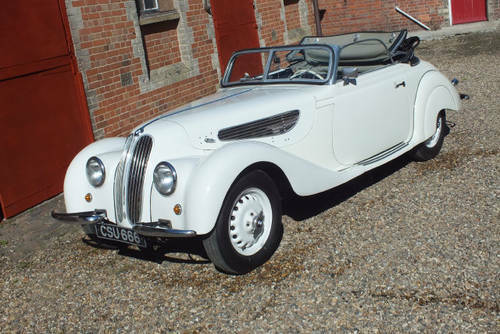 Clearly intending that it should be in very good useable condition, soon after buying the car its current owner sent it to BMW specialists TT workshops who gave it a comprehensive mechanical rebuild which is documented in a set of very detailed invoices. I do not know whether the engine has been tweaked or just happens to have been put in top notch condition but I can say that an identically engined Bristol 400 I owned several years ago didn’t go anywhere near as well as this car despite being in above average order throughout! 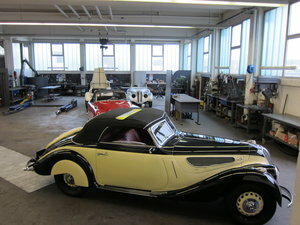 I would sum it up as being in good sound condition with very attractive original coachwork. 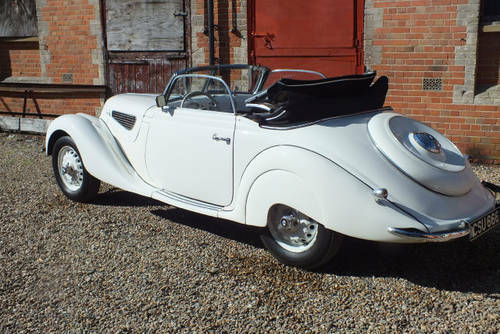 It is probably fair to say that the paintwork, although very presentable, would not win too many prizes at a concours event but to my mind that makes it much more fun to own than something which is just trailered to car shows. 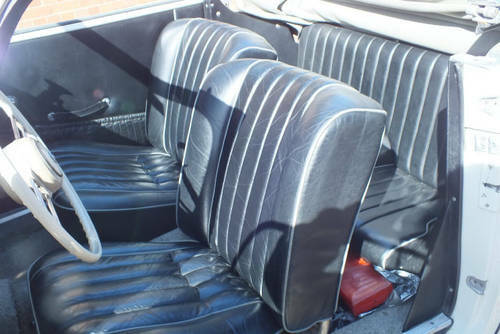 The interior trim is very good as are the very comfortable seats and the hood is remarkably easy to use though it would be fair to say that the carpets could probably do with being replaced with something a bit smarter. 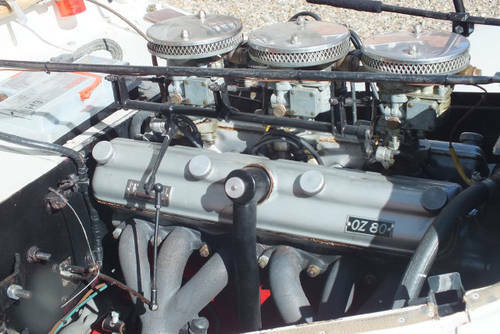 The engine starts readily and has a very purposeful exhaust note which is a delight to listen to as the superb two litre six cylinder crossflow 328 unit picks up revs at a quite astonishing rate. It has been fitted with a more modern Volvo overdrive gearbox which may not please the purists but I promise you that you will enjoy the way it lets you enjoy both spirited driving as well as comfortable high speed cruising. There are no untoward noises from the transmission and the suspension works really well so you soon gain the confidence to indulge in performance car motoring at a level which must have been quite a revelation in the late 1930s – in fact the only real problem I can find with this BMW is the difficulty I have in persuading myself to stop driving and put it back in the garage! We have had some work done on the brakes in which we were ably assisted by BMW specialist engineer Oliver Penney and BMW Historic Motor Club’s Technical Adviser Mark Garfitt - in fact I have been very impressed with how helpful everybody I have spoken to about pre-war BMWs have been which bodes well for anybody who is new to these cars. So here we have a very stylish and rapid grand tourer in the true sense of the term which has been driven by its owner in Italy, France, Switzerland and the UK without any problems and I can’t think of many better ways to go long distance motoring than in this car.